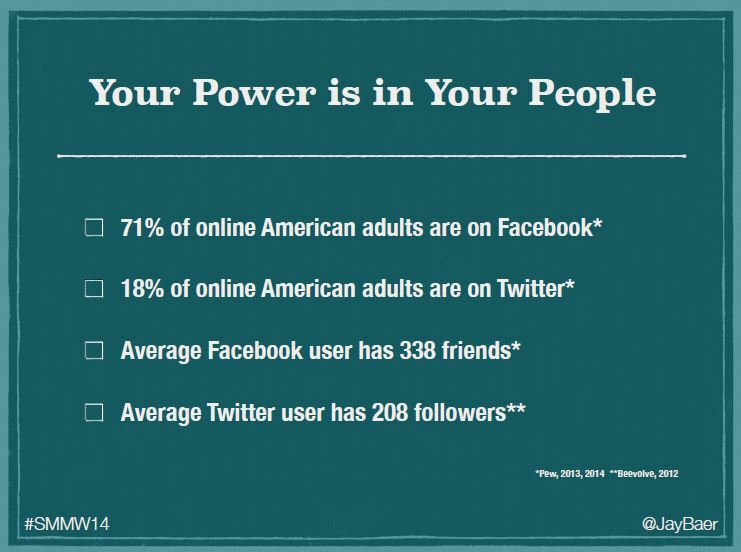 In my Bizzabo one-liner for the Social Media Marketing World 2014 conference, my goal was “to learn, connect and geek out”. Check, check and check. What I hadn’t counted on was having lots of fun, being in such a positive, friendly environment and having quite so many “aha” moments. This was my biggest aha moment and an area with huge potential. “Youtility” author Jay Baer noted that while 47% of Americans trust adverts, 92% trust recommendations from friends and family, even higher for millennials. If employees post and engage positively about their organisation on their personal social profiles, this is not only more compelling, but has an exponential reach compared with company-owned channels. Quick exercise: Identify the potential connections of your employees on just Facebook alone by calculating [(# employees x 71%) x 338], so for every hundred employees you have 23,998 connections. “social media policies will never be able to cure stupid”. “all employees are now in marketing and customer service”. 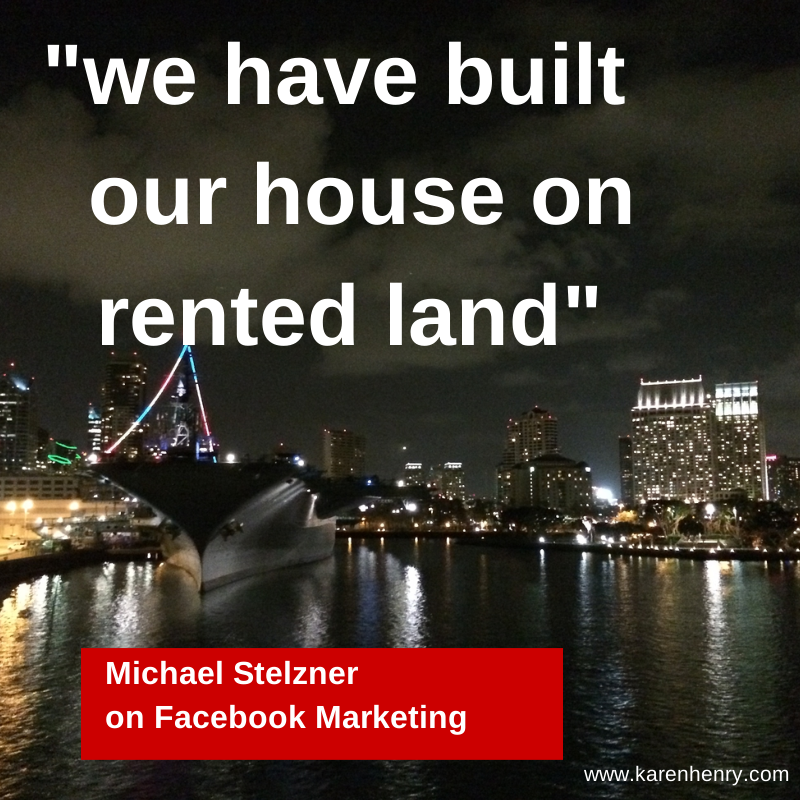 “we have built our house on rented land”. The solution? Build a great blog and own your connections. “emails are better than fans because they are portable”. offering a range of strategies to collect email and own your connections. 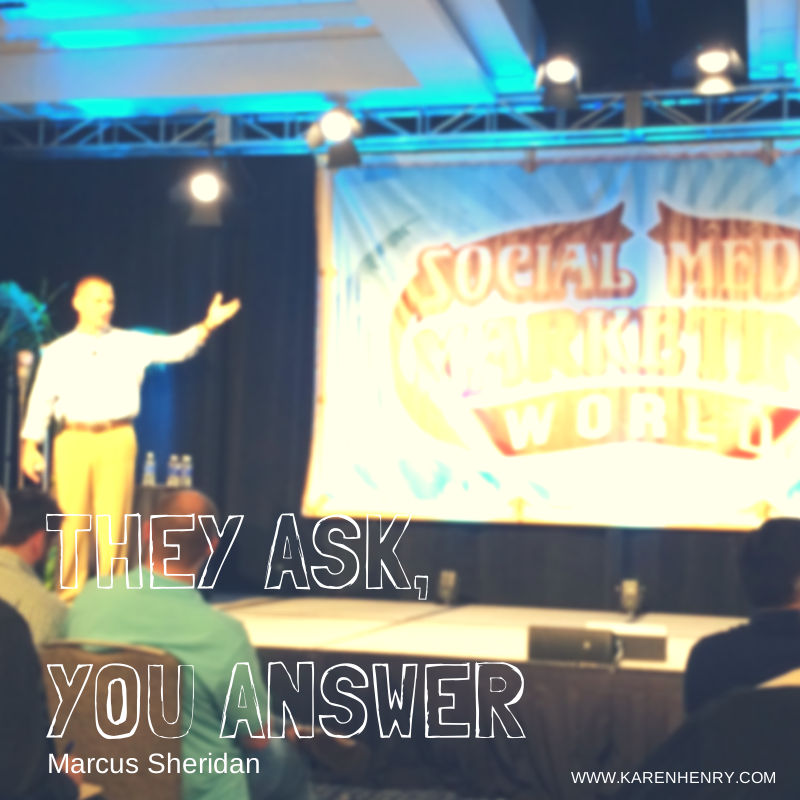 We’re all looking for more effective social media marketing and #SMMW14 has convinced me that Slideshare, LinkedIn and visuals have huge potential. “see yourself as nothing less than the Wikipedia of your industry”. A home truth related to employee advocacy: sales and customer service interact the most with customers, so their insight should influence marketing. What if sales BCC’d marketing when responding to customer queries? Simples. I laughed out loud when Ted Rubin dismissed the notion of ending blog posts with a question, sympathising with his view that it’s a pathetically transparent attempt to get comments and one that can backfire if your question is left unanswered. 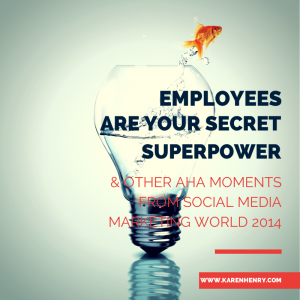 Nonetheless, at the risk of being Billy-no-mates, do you have any #SMMW14 ‘aha moments’ to share? Great blog, Karen! More than ever I wish I had attended Jay Baer’s session. Virtual ticket to the rescue! I agree that LinkedIn and Slideshare were huge takeaways and have great potential, but unfortunately didn’t see many “hands-on” tactics that demonstrated how to innovate on the platform. Need to do some tinkering to see how to best leverage both. The hardest part of the conference was deciding between sessions, the virtual ticket is a must. There were good tips in Jason Miller and Todd Wheatland’s sessions – I’ve started by following the companies on LinkedIn and Slideshare that they recommended. Lots to chew on. Looking forward to #smmw15 already. Good Job, Karen. Thanks Hugo, I’m glad it was useful. Great takeaways Karen! Lots of things changing so fast. One of my favorite sessions was from Nichole Kelly on Social Media ROI – measure what matters and stop trying to say it’s not measurable or it’s not important or it’s not based on leads and revenue. It is! Agreed, measurement is so important and it’s all about the bottom line. Nichole Kelly had great info and isn’t afraid to speak her mind – not to mention her great rapping skills! So true. I think it could be the silver bullet for many organisations.